Newton Stewart RFC continued their league campaign this week with an away trip to Garnock RFC. 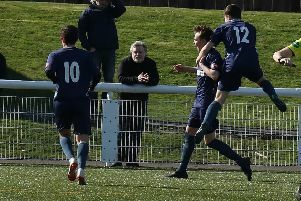 Garnock have been languishing at the bottom of the table of late, however every team is dangerous on their own turf and Newton Stewart needed to make sure they weren’t complacent. The early part of the game was a fairly tight-knit affair. With only a few minutes on the clock the Reds were awarded a penalty following an infringement from Garnock in defence. Stand off Jamie Muir delivered a well placed kick to put the visitors ahead by three points. The next half an hour saw a difficult spell for Newton Stewart. They had most of the possession but were hindered in their progression to the try line by some resilient Garnock defence and an inability to get quick ball. The referee seemed determined not to allow the game to flow, and a few harsh calls for the Reds left them frustrated. Garnock were awarded a penalty and took their chance to levels the scores once more. The score against them seemed to spur Newton Stewart into action. With only ten minutes left to play in the first half they finally found some rhythm and began to create the quick ball they had been looking for. Some powerful running from centre Craig Johnstone allowed the Reds to push their way across the gain line and winger Fraser Morton was on the receiving end of a well timed offload before crossing the line for his first try of the day. Muir converted to take the score to 3-10. This score relaxed the team a little and they began to play with greater fluidity. A scrum with a Garnock put in was awarded in the middle of the home team’s half. A phenomenal effort from the Newton Stewart pack saw them take the scrum against the head allowing back row David Montgomery to show his prowess with ball in hand as he made a charge towards the line. Garnock scrabbled some defence together, but James Wallace was right on Montgomery’s shoulder in support and received the ball before returning the pass just in front of the line to allow Montgomery to score a fantastic opportunistic try to a great cheer from the travelling support. Once again Jamie Muir was able to convert and extend the lead to 3-17 going into half-time. The second half started fairly well as the first had ended. Newton Stewart were once again largely in control of the game with a few fumbles coming between them and further scores. One such error resulted in a Reds’ knock on in the tackle and Garnock gathered the ball before throwing it out wide where their winger stretched his legs up the far side of the pitch. A brilliant try-saving tackle by Jamie Muir dislodged the ball which landed opportunely for Tyrell Wilson. The fullback made a great solo run almost the full length of the pitch before off-loading to prop Martin Wallace who had shown previously unseen pace to maintain support. Newton Stewart now recycled the ball a couple of times before Montgomery once more created a try by breaking through the Garnock defence and passing to Morton to score his second try, this time between the posts. A straightforward conversion for Muir followed. It was the home team’s turn now to have some possession and they began to run at Newton Stewart. Impenetrable defence has become a feature of the Reds’ team this year, however some missed tackles allowed Garnock to get too close and their momentum couldn’t be stopped at the last to allow them to narrow the gap by seven points. Just as happened in the first half, the score against them buoyed the Newton Stewart determination. Quickly after the restart the Reds found their way down to the Garnock try line and starting putting pressure on again. The ball was recycled a few times before being thrown wide to the receiving arms of centre David Sommerville who crossed the line for the final try of the day. This time the conversion into the wind just didn’t make the distance. Newton Stewart found the early part of this game frustrating and the points did not come easily. Patience was required and the team showed it, eventually creating chances and executing them flawlessly when they had the opportunity. Rapid counterattacking was fruitful for them too and showed how effective they can be when they play instinctively. Man of the match this week could be none other than David Montgomery. He scored one try, created another and repeatedly demonstrated how dangerous he is with the ball in hand. A massive performance from him created chances for the team. Newton Stewart are on the road again on Saturday 30th January to Cambuslang RFC.